Brushes are old. But how old? EMMY NOMINATION Have you missed it? Stream Season 1 on Amazon Today! TomorrowsWorldToday.com has many more stories about sustainability, technology, new ideas and worldwide concepts around innovation! Shielded Metal Arc Welding, or SMAW. Let's learn about it, shall we? Robolution What started with machines like a smoking robot from the 30's, the evolution of the interactive robot has finally reached science fiction levels of technology. No Ordinary Garden Man-made botanical bounties that need to be seen to be believed. 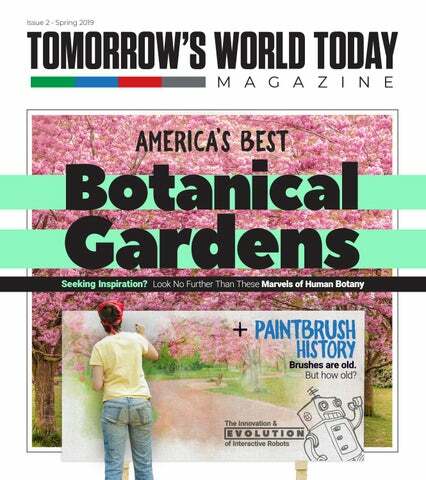 Spread across America, these beautiful botanical gardens have something for everybody. Paintbrush: The Original Tool? How long have humans been using paintbrushes? A very very long time, it turns out. Building a platform for the future Buildings of the future integrate people and systems in a dynamic and functional way. As the systems within buildings become more connected, new opportunities arise to achieve advances in risk management, network performance, productivity, space utilization and building intelligence. As a global technology distributor and innovator, Anixter helps building owners and systems integrators design infrastructure solutions for smart buildings, smart hospitals, smart campuses and, ultimately, smart cities. 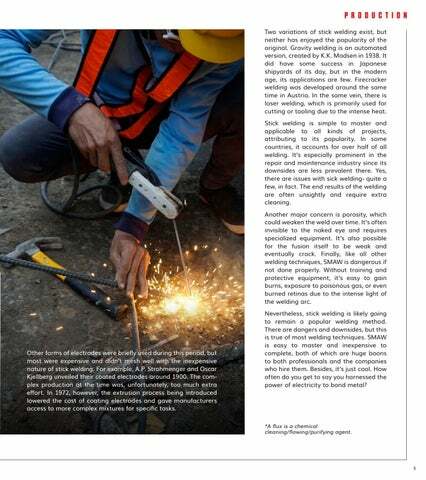 To learn more about smart building design, visit anixter.com/sbguide 18W0939GL ÂŠ 2018 Anixter Inc.
A Look at S tick Welding If you’ve ever seen somebody welding, chances are the technique they’re using is stick welding. It’s the oldest form of welding there is, and despite its age, it's still immensely popular. But it’s also a risky technique that doesn’t always provide satisfactory results. Actually, the first question is, “What is stick welding?” It’s the informal term for shielded metal arc welding, aka SMAW. It’s a manual arc welding process that uses a flux* powered by a consumable electrode. An electric current is generated from the electrode and a power supply to create an electric arc with the metals being welded. As the electrode and metal melt, they fuse, with the flux creating both shielding gas vapors and slag to protect the weld even further. It is primarily used for iron and steel welding. Stick welding has its roots in the 1800 discovery of the short-pulsed electric arc by Humphry Davy. Two years later, Vasily Petrov would discover the continuous electric arc. Little changed in the world of electric welding until 1881, when Auguste de Meritens developed and patented a carbon arc torch. This led to the development of carbon arc welding in 1885, with the first version of the electrode holder appearing two years later. The consumable electrode appeared in 1888, thanks to Nikolay Slavyanov. PRODUCTION Two variations of stick welding exist, but neither has enjoyed the popularity of the original. Gravity welding is an automated version, created by K.K. Madsen in 1938. It did have some success in Japanese shipyards of its day, but in the modern age, its applications are few. Firecracker welding was developed around the same time in Austria. In the same vein, there is laser welding, which is primarily used for cutting or tooling due to the intense heat. 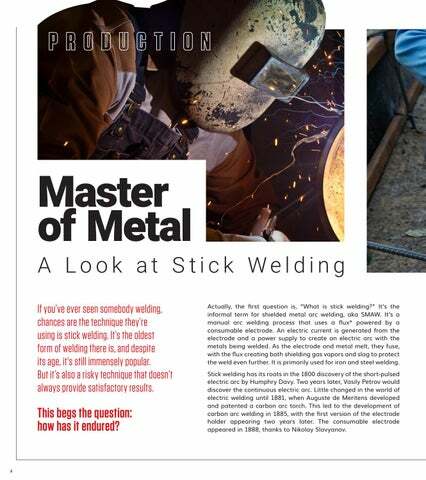 Stick welding is simple to master and applicable to all kinds of projects, attributing to its popularity. In some countries, it accounts for over half of all welding. It’s especially prominent in the repair and maintenance industry since its downsides are less prevalent there. Yes, there are issues with sick welding- quite a few, in fact. The end results of the welding are often unsightly and require extra cleaning. Another major concern is porosity, which could weaken the weld over time. It’s often invisible to the naked eye and requires specialized equipment. It’s also possible for the fusion itself to be weak and eventually crack. Finally, like all other welding techniques, SMAW is dangerous if not done properly. Without training and protective equipment, it’s easy to gain burns, exposure to poisonous gas, or even burned retinas due to the intense light of the welding arc. Other forms of electrodes were briefly used during this period, but most were expensive and didn’t mesh well with the inexpensive nature of stick welding. For example, A.P. Strohmenger and Oscar Kjellberg unveiled their coated electrodes around 1900. The complex production at the time was, unfortunately, too much extra effort. In 1972, however, the extrusion process being introduced lowered the cost of coating electrodes and gave manufacturers access to more complex mixtures for specific tasks. Nevertheless, stick welding is likely going to remain a popular welding method. There are dangers and downsides, but this is true of most welding techniques. SMAW is easy to master and inexpensive to complete, both of which are huge boons to both professionals and the companies who hire them. Besides, it’s just cool. How often do you get to say you harnessed the power of electricity to bond metal? *A flux is a chemical cleaning/flowing/purifying agent. 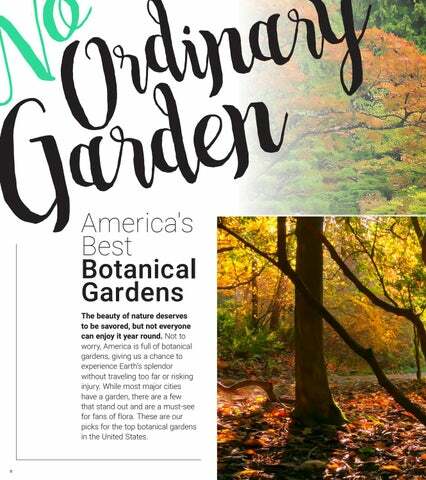 o y r a i d N Or n n e d r a G America's Best Botanical Gardens The beauty of nature deserves to be savored, but not everyone can enjoy it year round. Not to worry, America is full of botanical gardens, giving us a chance to experience Earthâ&#x20AC;&#x2122;s splendor without traveling too far or risking injury. While most major cities have a garden, there are a few that stand out and are a must-see for fans of flora. These are our picks for the top botanical gardens in the United States. Part of the University of Washington Botanic Gardens, the Arboretum feels less like a traditional garden and more like an adventure park. Boaters are welcome to bring their own vessels or rent from the facilities inside the park. Foster Island is home to everything from herons to trout, and on clear days, hosts views of the Cascades. 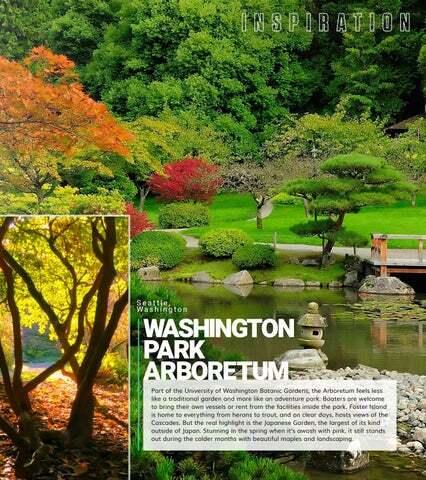 But the real highlight is the Japanese Garden, the largest of its kind outside of Japan. Stunning in the spring when itâ&#x20AC;&#x2122;s awash with pink, it still stands out during the colder months with beautiful maples and landscaping. MCBRYDE & ALLERTON GARDENS Movie buffs are sure to find something special at the Allerton and McBryde. Both the fourth installment of Pirates of the Caribbean and Jurassic Park had scenes filmed here, with tours highlighting the specific spots. It is home to the exclusive Allerton Beach, giving guests the chance to bask in the oceanâ&#x20AC;&#x2122;s glory. The Spice of Life Trail hosts spices from across the globe, ranging from allspice to vanilla. As part of the National Tropical Botanical Gardens, they also have access to the Breadfruit Institute. Animal fans rejoice: the Brookgreen Gardens also features a full zoo! The Lowcountry Zoo features native animals that have been displaced by urban development, both raised in captivity and wild. Thereâ&#x20AC;&#x2122;s also a butterfly garden for an additional fee. For those who prefer their creatures to be still, Brookgreen is also home to a sizeable collection of sculptures, displayed throughout the gardens and in three galleries. Oh, and did we mention that admission is good for a whole week? One common misconception regarding botanical gardens is that they must be green and lush. Well, when youâ&#x20AC;&#x2122;re in Arizona, both of those are difficult, so instead they have a garden unlike any other. While most gardens do feature a cactus room, the Desert Botanical Garden has an entire cactus walking path. Currently ongoing is the Electric Desert exhibit, which lights up the plants with beautiful colors and treats guests to an audio-visual spectacle. The exhibit runs through May 12, so get your tickets soon! For a more aquatic adventure, the Fairchild Garden is the place to go. Boasting eleven lakes and eight water features, guests can appreciate some rarely-seen foliage from dry land. Bird watchers will also be impressed by the sheer number of feathered friends on property, you may even want to borrow a pair of binoculars from the front desk. The Edible Garden is not just a delight to look at, but to munch on as well, with samples being available to purchase. There are also two other dining experiences, both highly rated, if you’re still hungry. The closest to Versailles in the United States. Perfectly symmetrical hedges line the paths of this garden, with the main mansion being home to fountains and exhibits of its own. But the real standout is the Canopy Cathedral, a giant treehouse that encourages guests to listen to nature. As the name implies, the inside holds reclaimed church pews and is a popular wedding spot. Of course, it’s also just one of their three treehouses. Both Lookout Loft and the Birdhouse offer similar views and experiences for those not afraid of heights. The bot’s head can tilt and swivel around like a human head. The closest robotics has come to a modern-day superhero is NASA’s hotshot humanoid robot R5 Valkyrie. This battery-powered bipedal bot can work alone in extreme environments without human assistance. Valkyrie is named after supernatural characters from Norse mythology who decided which warriors were rewarded in the afterlife. The robot builds on many years of NASA tests and feedback of previous robotic humanoids and features numerous sensors and actuators (moving parts) designed to help it carry out complex tasks. Its next mission is to Mars, with Valkyrie expected to take its first steps on the Red Planet before human visitors. The dark visor covers a 3-D vision system and camera. MOON MACHINE One of the robot world’s latest lunar exploration rovers is ATHLETE (All-Terrain Hex-Legged ExtraTerrestrial Explorer). Like a futuristic, super-sized, six-limbed insect, this rover can walk or roll over bumpy moonlike surfaces. Complete with a releasable grappling hook and a range of excavation instruments, ATHLETE is designed to move 100 times faster than existing exploration rovers. Valkyrie’s upgraded version includes modified humanoid hands to improve performance on the job. Each hand has three fingers and a thumb to grasp, manipulate, and work a variety of objects and instruments with precision and care. The actuators allow the wrists to roll easily, bringing further freedom of movement. A series of tests have pushed Valkyrie to its limits. The robot can drive, climb a ladder, use power tools, and walk through unstable terrain without stumbling. This intensive preparation will prove beneficial when Valkyrie makes it to Mars. PREPPING FOR FUTURE The Valkyrie team is constantly working to improve the bot’s dexterity to enable it to work alongside astronauts in preparation for future exploration. They will either save or destroy the world- and there’s no middle ground. Long before AI and interactive robotic technologies were possible, scientists, engineers, filmmakers, and science fiction writers were speculating on the different possibilities and potential outcomes of what robots would do for our society. Some take the doom and gloom approach that ends in a robotic apocalypse with lots of dramatic explosions, screams, and we’re guessing some ‘I told you so’s’. Others believe that the advancement of robotic technologies will only lead to a more advanced and prosperous human race. Though we’ve definitely been exposed to far too many Blade Runner or Ex Machina-esque films in our lifetime, this curiosity on the reaches of robotic technology dates long before advanced film graphics brought them to life. When did we get these ideas and how did they evolve into the AI tech we have today? It began with several iterations of robots doing simple tasks. People became fascinated by the idea of robots mimicking human behavior, and one of the more sophisticated and famous versions of this was built in 1937, over 80 years ago. A robot called Elekro was built and became the star of the New York City Worldâ&#x20AC;&#x2122;s Fair in 1939 and 1940. He was the most advanced robot of his time. This may not be impressive to our modern-day minds, but Elektro could turn his head side to side, up and down, and when he talked, his mouth could open and close. According to Cult of Mac, he was built with a system of camshafts, gears, and motors so he could walk, talk, and even count his fingers. A control unit was used to transfer voice commands into electrical impulses through telephone relays and vacuum tubes. All of this was impressive for the time period, but the thing he was most famous for...he could smoke. Though we now know the dangers of it, smoking was quite the fad back in the day and there was something about seeing a robot engage in such a human activity that simply drove people crazy. Crowds came from all over and stood in lines up to three hours long just to catch a glimpse of the smoking robot. The technology was so unbelievable for the time that Elektroâ&#x20AC;&#x2122;s creators designed him with a hole in his chest, just so people didnâ&#x20AC;&#x2122;t think there was a man inside the aluminum suit. From the 1980’s to the end of the 20th century, AI research went in and out of fashion while several advancements were made. Did we make another leap toward artificial intelligence in the 90's? One of those advancements was Expert Systems. Expert Systems was a program created by Edward Feigenbaum that would mimic the decision-making process of a human expert. Essentially, this program would ask an expert in a field how they would respond to a given situation and it would store that information from the expert. Then, once it repeated that process for all possible situations, non-experts could receive advice from the program. Thanks to Deep Blue, chess we did! Though we had long been in development of a chess-playing robot, it wasn’t until the year 1997 that its greatest ambition was achieved. Reigning world chess champion Gary Kasparov was defeated by IBM’s chess playing program Deep Blue. This was a huge step not only in terms of public perception of AI but also towards an artificially intelligent decision-making program. We even started to see interactive robots being used as children’s toys during this time as well. Though this little guy didn’t last too long, he still lived on after production ceased in 1990. He’s made several cameo appearances in Nintendo games, including Mario Kart DS, Super Smash Bros. Brawl, and WarioWare. Who can forget the Great Tamagotchi Craze of the 90’s? These little devices held within them a digital pet that children would feed, play with, and care for just the same as a real pet. Though it may not look so sophisticated to us now, this was the first experience with interactive robotic technology for a lot of 90’s kids out there. an interactive robot that could be used to substitute a second player in Nintendo games such as Stack-up and Gyromite. Do. Of course, modern-day interactive robots have far surpassed the days of R.O.B. In fact, we’ve come to a point in our society that we interact with robots virtually every single day. Whether we’re having a chat with our pals Siri and Alexa or letting our phones take us to our friend’s house or even being driven with new driverless cars. As famed comedian John Mulaney said in his most recent stand-up special, “You spend a lot of your day telling a robot that you’re not a robot.” Bizzare, isn't it? Though we saw the beginnings of this movement in the past, interactive robot technology is now used very highly in the children’s toy market. There are Anki Drive smart race cars that are programmed to stay on course. There’s Robo Me, a smartphone interactive robot that can be programmed with different quirks and personality traits. One of our personal favorites is a new update on a classic toy- Aibo the Robot Dog. Though this little guy was first brought onto the market in 1999, his most recent update really lives up to the hype. With incredibly realistic movements, this pup can play fetch, kick his ball, respond to several voice commands and touch sensors, and he charges himself all on his own. It’s basically like having a real dog without the house-breaking. Learn. Some additional noteworthy advancements include Sophia, the first robot to ever be declared a citizen of Saudi Arabia. Essentially, Sophia is a much more sophisticated version of what we saw back in the day with Kizmet. She’s designed to both be able to understand and mimic human facial expressions. She can read your mood on your face and, according to CNN, she has simulations of every major muscle in the human face. This allows her to express joy, curiosity, confusion, contemplation, as well as many other complex emotions. She also has a sense of humor. Another take on emotive robotic technology comes to us in the form of Pepper, a robot created by SoftBank Robotics. Pepper is also able to speak and react to human emotions through body language. He’s even able to express his own thoughts, accompanied by adjusting eyes and tones of voice. The approach on Pepper is focused more on recognizing your emotions as opposed to being able to express emotions facially. According to SoftBank’s website, “Pepper wants to learn more about your tastes, your habits, and [sic] quite simply who you are.” While there is only one Sophia, Pepper’s are popping up all over the place. He’s been installed at various Mizuho banks in Japan and Nestle is planning to install him in various Nescafe sales outlets so he can help explain and sell products. He’s also the first humanoid robot that can be “adopted” or taken home to become a household companion. Needless to say, we’ve come quite a long way since. With each advancement, different questions have been posed with the answers pushing us a little further along our technological path. So, are they friend or foe? Perhaps that’s not the question we should be asking. Instead, with the emotive advancements taking place, we pose this question instead: Are they friend? We can’t BB-8 to find out. Although we didn’t actually begin to interact with robots until much later, we can see that curiosity bloom from very early on in human history. In the Iliad, Hephaestus creates three-legged tables and bronze statues that serve as assistants. Some of the earliest functioning iterations of robotics were when humans invented functioning clocks. Leonardo Da Vinci even drew up plans for a humanoid in the form of an armored knight that could sit up and wave its arms. Though there was a long fascination with artificial animation, the first real accomplishment of interaction happened in a rather… unexpected way. In the early 1730’s, a French inventor named Jaques de Vaucanson created what he called The Digesting Duck. You heard us right- The Digesting Duck. This mechanical device would give the appearance of eating kernels and digesting them. In 1950, Young British Scientist Alan Turing came up with what we now refer to as The Turing Test. He theorized that humans use information and reason to solve problems and make decisions- so why can’t robots do the same? He wrote a paper titled "Computing Machinery and Intelligence," which theorized how to build machines that were capable of intelligence. Though he is still famous for laying the groundwork that would eventually become what we know today as AI, he didn’t get to embark on the journey himself. According to Harvard University, this is mainly because computers needed to make a dramatic change. As previously stated, up until this point, robots were solely used to imitate human behavior. Therefore, they were only designed to execute commands rather than to store them or any additional information. However, Turing’s research jump-started several programs designed with the goal to create a robot that was capable of problem-solving skills and decision making. NO MATTER HOW OR WHERE YOU CHOOSE TO TRANSACT A smarter approach to protecting your accounts FICO helps banks extend the boundaries of convenience and security with machine learning that detects suspicious account activity. It’s working behind the scenes to provide remarkable banking experiences while protecting you from financial harm. FICO and Falcon are registered trademarks of Fair Isaac Corporation in the United States and in other countries. © 2018 Fair Isaac Corporation. All rights reserved. painting is easily humanity’s oldest art form. And the most popular tool for pigment spreading, the paintbrush, has been around nearly as long. But just like the craft it’s used for, the paintbrush’s history is a muddled one. Let’s see if we can’t peel back a few layers to reveal the truth underneath. is often credited as the inventor of the paintbrush, but there is evidence pointing to even earlier use. Its most primitive form may have been made over 12,000 years ago. Cavemen used sticks, bones, and palm leaves to recreate scenes using dirt and juice. That said, Meng Tianâ&#x20AC;&#x2122;s involvement isnâ&#x20AC;&#x2122;t entirely miscredited; the paintbrush as we know it first emerged around 300 B.C. The shape of brushes differed from culture to culture. The bristles were (and are) arranged in various patterns to achieve different brush strokes. Some have long, thin tips at the end of a rounded bristle. Others are flat and straight. The thickness and coarseness of the brush is another factor. All of these depended on what art style was favored by each culture. Today, there is more variety in paintbrushes than ever before. The materials used to create paintbrushes has also varied. The Chinese would craft handles out of bamboo. Ancient Egyptians crushed the ends of reeds to make brushes. By the 15th century, quills were the favored implement. The one element that unites all these brushes though is the brush itself. Animal hair was always used to create the bristle (so named from the rough hair of the pigs and boars used). Even now, higher-end paintbrushes feature animal hair. For those not interested in spending a fortune on brushes, there are many that use synthetic fibers for bristles. These first started appearing during the industrial revolution. Further advancements like metal ferrules and flat brushes were also introduced. Ironically, while these new brushes helped pioneer new styles, the home of quality paintbrushes returned to the East. Initially, Russia dominated the industry, before switching to China after the Russian Revolution. 1850s and 1920s. Fortunately for brushes, they returned to the spotlight thanks to the success of Bob Ross and his TV show The Joy of Painting. Indeed, Ross is still heavily associated with the art and his brand of brushes continues to be a best-seller. Even with the rise of digital art, traditional painting is not in danger of disappearing. Paintbrushes are therefore also secure for the future. Itâ&#x20AC;&#x2122;s humbling, in a way. Even with all the technology in the world at our disposal, we continue the arts our ancestors invented so long ago. We still use the same tools they crafted. Sure, there are some tweaks and improvements, but the overall product is the same. Thank you, paintbrush, for making the world our canvas. Before his death, Rudolf Staechelin had one of the largest art collections in his native Switzerland. After his passing, his heirs held a private sale of some of his collection. Among them was Gauguin’s work, whose title translates to “When Will You Marry?”The State of Qatar bought the painting, which depicts Tahitian women in the traditional and Western-style dress. The price tag came out to $210 million in 2014, $213 today. During the same sale that secured him Number 17A, Kenneth C. Griffin bought another painting: Interchange. Another surrealist/abstract work of art, it was completed in 1955 by the Dutch-American painter de Kooning. Griffin spent about $300 million on this piece. At the time, it was the most spent on any painting ever in history. But that amount was surpassed two years later. Investing in art takes time, research, and, primarily, money. Paintings, in particular, are known for fetching incredibly high prices, ranging in the millions. The trend of paying so much for art began in 1987 with the purchase of Vincent van Gogh’s Vase with Fifteen Sunflowers for a record-setting $39.7 million. Adjusted for inflation, that’s $73.8 million. And yet that’s considered one of the lower price tags for art. The top five are far more expensive. Kenneth C. Griffin, the founder of global investment firm Citadel, is known just as much for his company as he is for philanthropy. When he’s not generously giving money to those in need, he’s investing in his own personal art collection. At a private sale hosted by Dreamworks co-founder David Geffen in 2015, Griffin dished out roughly $200 million for a Pollock painting (about $203 million today). The painting is one of Pollock’s famous drip paintings, created in 1948. George Embiricos adored fine art and coveted the masterpieces he obtained. Picasso, Kandinsky, Van Gogh- he had them all. He also had a humble little painting by Cezanne of two men playing cards. He parted with the work in 2011 to the State of Qatar in a private sale. Interestingly, the sale was so private that not even the exact purchase price or currency used is known. Most estimates put it between $250 and $300 million USD, or $270 million plus in 2018. $450.3 million. This was the price that the Abu Dhabi Department of Culture and Tourism paid for da Vinci’s painting of Jesus Christ. Beating the previous record by $150 million, the outcome of the auction at Christie’s in New York shook the world. It’s set to be on display at the Louvre Abu Dhabi in the United Arab Emirates. It is one of the few known works of da Vinci’s and was nearly dismissed as a fake until restoration. America is full of botanical gardens, giving us a chance to experience Earth’s splendor without traveling too far or risking injury. While most major cities have a garden, there are a few that stand out and are a must-see for fans of flora. These are our picks for the top botanical gardens in the United States. If you’ve ever seen somebody welding, chances are the technique they’re using is stick welding. It’s the oldest form of welding there is, and despite its age, it's still immensely popular. But it’s also a risky technique that doesn’t always provide satisfactory results.